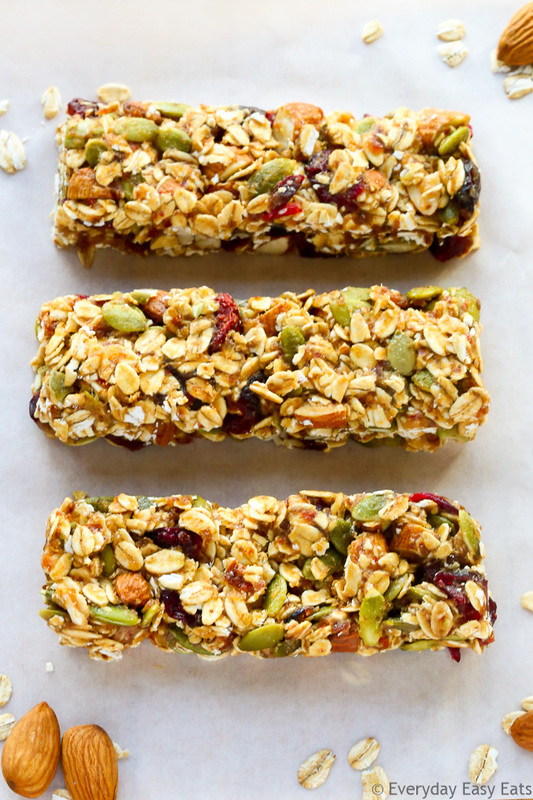 This No-bake, Healthy Fruit & Nut Granola Bars recipe is made with just 6 ingredients. These homemade granola bars are chewy, so simple to make, and just as delicious as they are nutritious! It’s great to make homemade granola bars, because that way you get to control what goes into them. This recipe is made with a bunch of good-for-you ingredients, such as rolled oats, almonds, pumpkin seeds and dried fruit. A naturally-sweetened base of pureed dates and honey binds everything together. These homemade granola bars are perfect for snacking, because they are super tasty, portable and will keep you feeling full for a long time. They provide a good dose of healthy fats and fiber from the almonds, pumpkin seeds and oats. For the dried fruit in the recipe I used dried cranberries, but you could use raisins, dried cherries or any other dried fruit that you have on hand. When adding the date-honey mixture to the dry granola mixture, use your hands to mix everything together! Using a spoon will not cut it, because the mixture gets super sticky (that’s why the granola bars hold together so well without baking). Once all of the ingredients are combined, press the granola mixture very firmly into the baking pan with your hands, a flat dish or the sides of a mug. Allow the granola mixture to chill and harden completely before cutting into bars. This will ensure that the granola bars hold together when sliced. Although I love to make my own granola/snack bars, I, just like you, don’t always have the time to do so. It’s perfectly fine to purchase pre-packaged bars, as long as you buy the right ones. Unfortunately, many pre-made granola/protein/snack/energy bars are made with all kinds of harmful additives, such as artificial flavors and colors, excess sodium and sugar, and non-food ingredients. RXBARs: These nutritious, junk-free protein bars are made with whole foods and simple ingredients like egg whites, fruits, and nuts. RXBARs are dairy-free, soy-free, gluten-free, and contain no added sugars. They are perfect for breakfast on-the-go, an afternoon snack or for pre/post-workout fuel. EPIC Bars: These bars combine meat, fruit, and nuts to create a savory, healthy protein bar that is high in nutrients and low in sugar. All EPIC bars are gluten-free, grain-free, dairy-free and soy-free. My personal favorite flavor is Chicken Sriracha – it is SO good! Health Warrior’s Chia Bars: These snack bars are made from 100% real food, are completely plant-based and free of gluten, dairy, GMOs and soy. Each bar is only 100 calories and also has only three grams of sugar, which is super low compared to most snack bars made by other brands. Alright, now back to what you came here for: my recipe for Healthy Fruit & Nut Granola Bars! 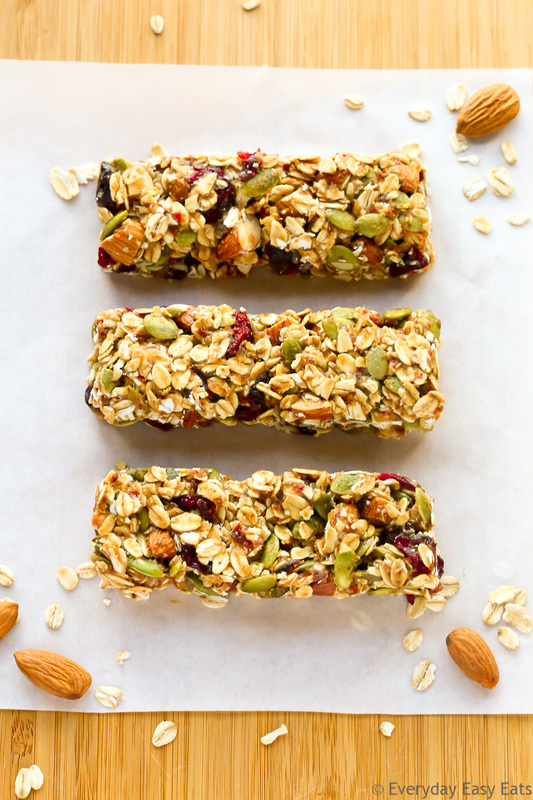 This No-bake, Healthy Fruit & Nut Granola Bars recipe is made with just 6 ingredients. Chewy, simple to make, and just as delicious as they are nutritious! 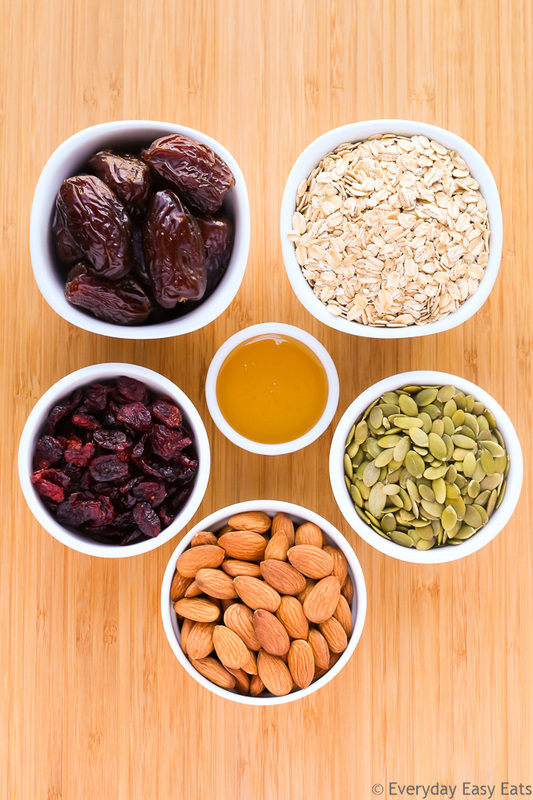 In a large mixing bowl, combine oats, almonds, pumpkin seeds and dried cranberries. Add date mixture to oat mixture and mix, using your hands, until combined. Scoop mixture into the prepared pan and firmly press into an even layer. These look good. Will try to make these. They look really delicious, I know my boys would love them! Thanks Sheena! I love making them because they have so much less sugar than store-bought granola bars, but still taste good! These bars look yummie,… how long can i keep them in the fridge? Hi Peter! Thanks so much! You can store them in the refrigerator for up to 2 weeks. 🙂 I hope you get a chance to make them soon! Can peanut butter be added? Would I need to replace a different ingredient? Hey Rebekah – I have never tried making the recipe with peanut butter before, so I can’t say for sure how it will turn out. If you do make it with peanut butter let me know how it goes! I love that these do not have peanut butter – I am a huge pb fan but I have to start making nut-free snacks for my son’s preschool snacks! These look terrific Alia!! Can you provide nutritional information please? Hi Lystra, thanks for your feedback. I’ve never had an issue with them not holding together, because I always make sure the granola mixture is completely chilled and hardened before cutting it into bars. I’m happy that you got the recipe to work in the end and that you liked how the bars tasted! 🙂 Hope you have a great weekend! This recipe is OUTSTANDING and so ridiculously simple! I didn’t have any almonds so I toasted some pecans and used those instead and it was fantastic! Will never buy in store again!! Thanks! Hi Jennifer! Wow thank you so much for your lovely feedback! 🙂 Toasted pecans would definitely taste delicious in these bars. You are very welcome!! I’m happy you liked the recipe! Might be a silly question but is the 190 Calories per bar? Thank you for this wonderful recipe. I tried it yesterday and it came out perfect. tasted really yummy. Hey Cinnamon! I am so glad you enjoyed the granola bars! 🙂 You are very welcome! Amazing! I tried to mix the dates with creamy honey which was a bit difficult. Maybe liquid honey would be better. The first time i made these, they didnt stick together, so this time i put them in the warm oven just to warm the honey up. Best bars ever! I finished them 10 minutes ago and they are almost gone now! Thank you for this awesome recipe!!! This looks so good! What a yummy one to make with your kids for their school lunch! Hi Suzanne! Aww thanks so much! <3 I hope you get a chance to try them sometime!